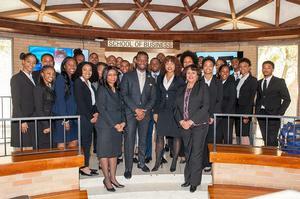 Hampton University School of Business takes a photo with BET representatives, Tiyale Hayes and Morgan Grayned. HAMPTON, VA (April 15, 2019) – Hampton University’s School of Business hosted their weekly Leadership Application Program on Wednesday, March 27th, 2019 with two alumni from Black Entertainment Television Networks, respectfully known as BET Networks. Tiyale Hayes (‘98) and Morgan Grayned (‘15) are both graduates of the Hampton University’s School of Business and were the honorary guest speakers on behalf of BET Networks for the Leadership Application Program. Hayes earned his Bachelor of Science degree in Marketing and is now the Senior Vice President of Consumer Insights for BET. He has a background in strategy development and a proven track record of business-building ideas with males, females, teens and ethnic targets. At BET, Hayes is charged with creating consumer-inspired brand strategy and compelling programming that connects to rich and vibrant African American audiences. Grayned earned her Bachelor of Science degree in Business Administration with a concentration in Leadership Studies and Marketing. As a hardworking intellect, she is a passionate professional who is eager to continue to learn more about the field of marketing, advertising, sales, and market research. She is currently working as a Consumer Insight Analyst at BET. “It’s awesome to be back at my ‘Home by the Sea.’ I was most excited to see the students. I feel it’s great to see people who will potentially follow in my footsteps, being able to speak to them and making this connection with BET. I know when I was a student, we didn’t have this opportunity to speak to an entertainment company. I was excited to lend out a helping hand in the workforce,” said Grayned. As Senior Vice President of Consumer Insights, a big part of Tiyale Hayes’ job is to sit down and chat with people to gather statistics geared towards the African American community. Hayes gave an interactive presentation, discussing the significance of the way black men are depicted through media, entitled, “Black Men Revealed.” He enlightened students on the statistics of black men and the struggles they face on a daily basis throughout the United States. Launching in 1980, BET, a division of Viacom, is the most prominent television network targeting African American audiences, broadcasted in the United States, Canada, France, and Africa. More than eighty-eight million American households are currently receiving this channel.